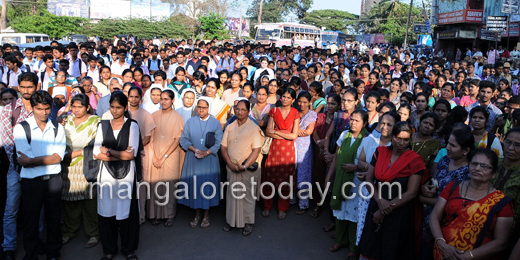 Mangaluru, March 4, 2015: In a spontaneous action Christian youth organisations of Dakshina Kannada and Mangalore Diocese held a peaceful protest in front of the DC office commencing at 5 pm today March 4. With emotional and true sentiments that Mother Teresa and other Christians and their beliefs being targeted by right wing elements and the silence of many leaders forced the Christian youth organisations to hold a calm and orderly protest. 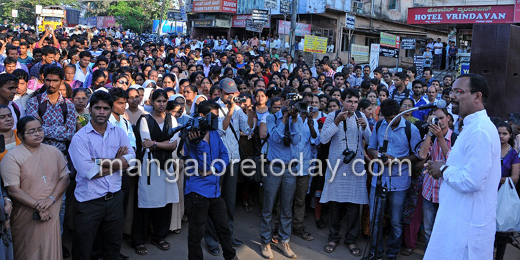 The community leaders too were present to express solidarity with the youth of the community and support. Mainly Fr.Moras Prabhu Vicar General,Roy Castelino Konkani Sahitya Academy President, Mandd Sobhan leaders and youth leaders were present. A huge orderly crowd was present. 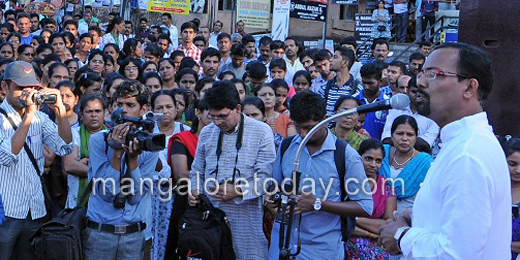 Apart from speakers giving touching speeches, the gathering also prayed for the troubled elements who had spoken disparagingly of Mother Teresa and the Christian sentiments. The key note speaker Vincent Alva, in line with other speakers, extolled the virtues of Mother Teresa that have been recognised across the world and the great services acknowledged by World and Indian leaders for the education and medical welfare of India for ages past and today too hold the top places for educating the needy in India and contributing greatly to uplifting the Indian cross section to the modern heights. The leaders hoped that disgruntled elements will refrain from unnecessary disturbance to the peace and welfare of common citizens. The protest was followed by a brief candle light vigil, in acordance with the Mother’s words that only ’a light can dispel darkness’. Solidarity as Christians was projected in ample measure by Yuva Jagrath Vedike, ICYM, YCS, Diocesan Youth and many youth organisations. Among those leading the action were Director Ronald D’Souza, YCS Director Edwin Correa, President Melrida Rodrigues, Stany Alvares, Sheldon Crasta, Aicuf members, Priests and nuns too participated in the prayer vigil. The message was brought across effectively according to the opinion of the general public.